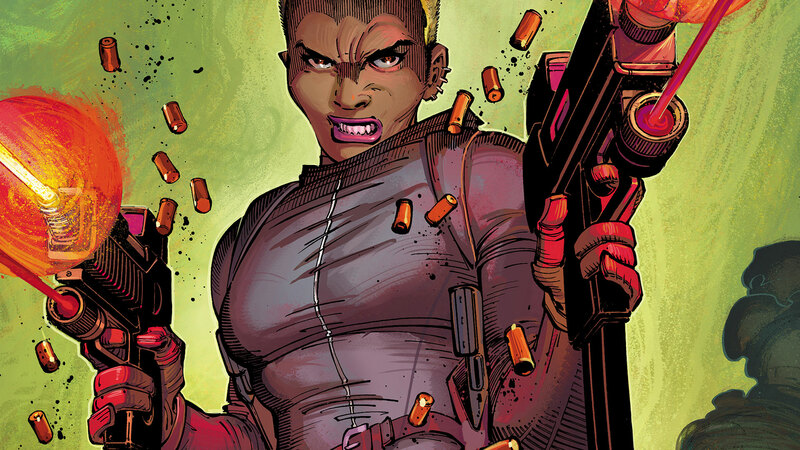 John Romita, Jr. and Dan Abnett’s THE SILENCER #1 succeeds not by treading new ground, but by using the familiar to shock, surprise and subvert so many of our expectations. It occurred to me near the end of THE SILENCER #1 that Talia al Ghul is not someone you want complimenting your son. It’s not a particularly shocking revelation, but it’s something I’d never given much thought to before Honor Guest, the Silencer of the book’s title, objects to Talia’s praise of her boy. Yet, taken strictly at surface level, it IS a little surprising. The moment happens as the two old acquaintances are driving through a South Carolina suburb in a sedan. Typically, you put two mothers who haven’t seen each other in years in a car and that’s exactly the sort of small talk you would expect. It would be weird for Talia NOT to say something nice about Honor’s family. But The Silencer, which is the second book to be released in DC’s New Age of Heroes line, is all about subverting the expected and typical. Prior to her domestication, Honor worked for Leviathan, the criminal organization run by Talia al Ghul and introduced during Grant Morrison’s run on BATMAN. What role Honor held within Leviathan is not yet known to us, but whatever it was, it was significant enough for Talia to agree to release Honor from the organization, making it clear that Honor had earned her freedom. Since then, Honor’s built a typical suburban life for herself, one that’s on the verge of crashing down around her as a rogue element that’s come to power within Leviathan sets their sights on her. Those are the basic beats of the story, and if you’re thinking it all sounds a bit familiar, that’s because The Silencer isn’t really about treading new ground. It’s more about using a familiar kind of story to surprise us, often by presenting things in a way we’re not accustomed to seeing them. However, the best way that The Silencer subverts our action comic expectations is right there in the name. Honor “silences” her opponents, but not strictly in the way we’re used to in crime tales. Rather, she actually possesses the ability to create a zone of silence around her, allowing her to dispatch her enemies stealthily. It’s an interesting ability for a super hero, and one that’s totally at odds with what we expect from these kinds of stories. Action movies are notoriously loud, packed with fistfights, gunshots, explosions and cheesy one liners. The Silencer strips all of this noise away and lets the action on the page do the talking. It works particularly well in a comic book, since comics are a silent medium to begin with. (I imagine it would be a lot more jarring and difficult to make work in film or TV.) However, it could easily fall on its face if the team behind The Silencer weren’t skilled enough to actually pull it off, but John Romita, Jr. and Dan Abnett are two of the best in the game, and it shows here. Romita is a consummate visual storyteller. The action is always clear, even when it gets weird, and that’s good because it’s the action that drives the narrative in The Silencer. Often, entire scenes are set just by a small panel or two, like the way Honor’s eye is framed as her husband heads down to answer an unexpected doorbell, or the visible scissors in her back pocket as she heads down the stairs two panels later. These are key moments and details that draw you into the scene and really build suspense. I suspect that as The Silencer continues, the focus will move from subverting our expectations to just telling a great story. But to get to that point, you need to get readers engaged from the start. And it’s hard not to be engaged with a setup that feels both familiar and unique. Honor Guest is a fascinating character who still has plenty of mystery surrounding her to explore. The threat she’s now under opens the door to both action and drama—how will her husband react when he learns about her former life? The villains are frightening and powerful, the stakes are personal and real, and the one familiar character in the story has so far been presented in a new and different way. Yet, beneath all of this is a message that’s both powerful and reassuring to those of us living very “ordinary” lives: Ordinary is great. Ordinary is where we’ll find what’s most valuable in life. And ordinary is worth fighting for. THE SILENCER #1 by John Romita, Jr., Dan Abnett, Sandra Hope and Dean White is now available in print and as a digital download. For more on the New Age of DC Heroes, click here.